OverviewThis unit focuses on World Car Free Day -- an event celebrated by millions of people to highlight the problems caused by our dependence on cars and to raise awareness of the impact car free days can have on the environment. The text and some of the activities are from the Breaking News English website. When the class starts, ask students not to sit down. (If your students don’t usually stand when the lesson starts, ask them to do so.) Tell them you are going to read out the statement “Sit down if…” and if the sentence is true for them, they can sit down. Once everybody has sat down, put the first of the following pictures on the board or project it. Ask students to have a think and put any idea/thought/feeling/impression they get when they look at the picture on the board, around the photo. After they have collected a nice amount of ideas, change the picture for the second one below. Now, ask your students to relate their previous ideas to the new picture in pairs. Conduct brief open-class feedback at the end of the activity. After getting the main theme of the lesson, tell students they are going to read about a special day in connection with the pictures, but they need to clarify some words for the text. Put students into pairs and ask them to match the following words with their synonyms or definitions. If there are some uncertainties, quickly pre-teach the problematic words so that everybody understands the items. Note: This activity is adapted from Breaking News English. Other online activities, listening at five speeds, multi-speed readings, dictation, speaking activities and printable handouts are available for this lesson at http://www.breakingnewsenglish.com. Hand out the text and ask students to read it and complete it with the words they have been working with. Note that in some cases, they need to change the form of the words. To check the solutions, ask a student to read it out or play the audio that is available on the BNE website. Ask the group to come up with 20 questions they would like to ask about World Car Free Day. To reflect on the theme and idea of this day, ask students to come up with some pros and cons in connection with the idea behind the initiative. You might want to switch pairs if you feel some movement would do good to the group. Conduct open-class feedback in the end and lead a whole-class discussion. Collect as many questions/controversial statements/quotes about the article or the topic of travelling or sustainability as the number of group members, write them on a piece of paper and before class, stick them on the bottom of your students’ chairs. When you reach this stage, tell students to check their chairs, get the slip of paper, and discuss the question with their partners. After a specific amount of time, make them swap questions with another group member. After discussion, pick some of the questions and ask the group what they have discussed. 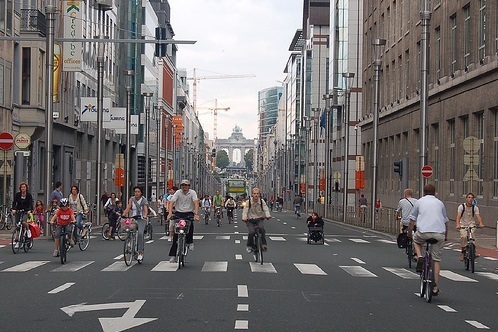 Do you think city centres should be closed to traffic? Do you like the idea of World Car Free Day? Some cities leave thousands of bicycles for anyone to use. Do you think it’s a good idea? Do you think you should change the way you travel around every day? Do you think events as WCF Day have a big impact on the world? ● Here some images for WCF Day, 22 September 2016: http://goo.gl/GP4A7D Students can pick out and discuss the images they especially like. They can also get together in small groups and draw some images for WCF Day. Is it being celebrated in the city or country) they live in? If so, how? 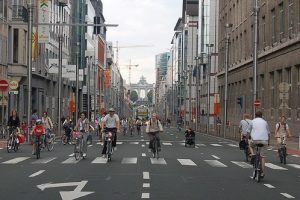 “Every year on or around 22 September, people from around the world get together in the streets, intersections, and neighbourhood blocks to remind the world that we don’t have to accept our car-dominated society. ● In a post-carbon society, transport will also be much more by electrically-driven vehicles, especially (we hope) in public transportation. Lots of cost-free electric buses, helping people get around. What do students think about a campaign for cost-free public transport, preferably small electric buses? Let transport become a social right offered to all. ► At Naresuan University in northern Thailand (city of Phitsanulok), there are many electric buses running throughout the day around a large campus, cost-free, anyone can get on or off. The system works, and is low-cost, highly friendly to the air and environment. Could students image that in their own town, paid for by the local government? ◘ Some students and teachers can look at what the PCI is advocating: http://www.postcarbon.org/program/erc/ This is the politics of energy and how it needs to change. Here an excellent video on FREE PUBLIC TRNASIT It focuses in part on Tallinn in Estonia, that has introduced a successful free city bus system. 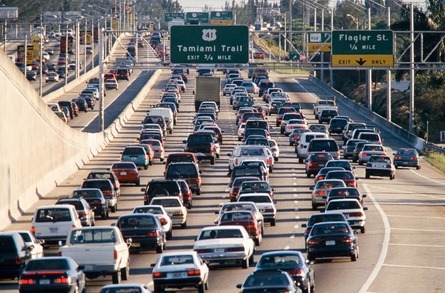 It cuts down on the tidal wave of private cars many cities are drowning in. I love the idea of that lesson! Your plan of a school lesson is great! I’ll try it with my class. Thank you so much for sharing this! Rezervni chasti (spare parts) above is probably a joke as comment. Another dimension of the culture of ‘automobility’ is air pollution, which in many cities is significantly from car exhaust, coupled with stove exhaust in wood- and coal-burning stoves in some countries. Here a WHO report brief overview, titled “90 percent of world population breathe dirty air”: http://goo.gl/yslWiW Maybe you and your students and loved ones are among that 90%. http://www.greenpeace.org/international/en/about/worldwide/ There is most likely a branch in your country, get involved.